STAR WARS, 1976. Chaykin original Comic Con folded movie poster #1 (20 x 29″) for sale starring Mark Hamill, Harrison Ford, Carrie Fisher, Alec Guinness, Peter Cushing, and director / writer George Lucas. 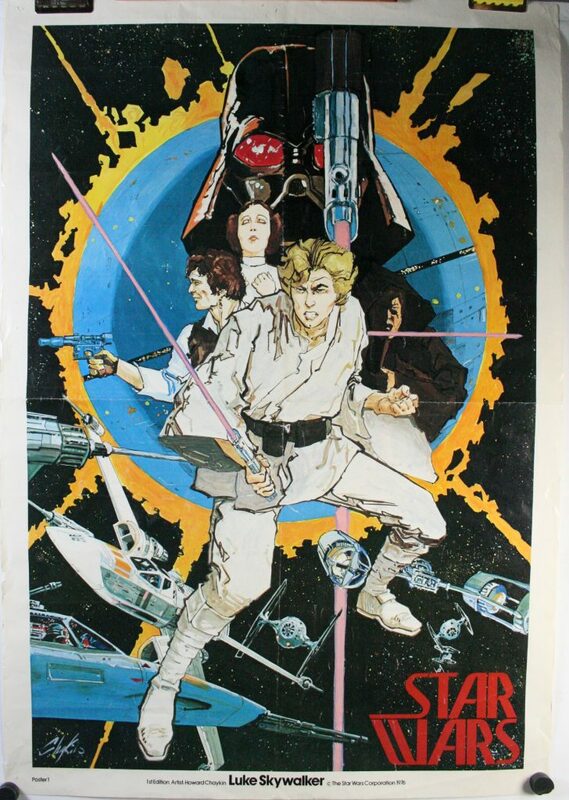 This poster is largely considered to be one of the most collectible posters of all the Star Wars posters made. It is actually not a theatrical movie poster, but an early effort by 20th century fox to drum up excitement for Star Wars Episode IV. Their first task was to contact Howard Chaykin and contract him to illustrate a serial comic book to hype up the upcoming movie. After all the contracting was finalized about the original comic book series this Star Wars poster #1 was painted and 1,000 posters were printed and released advertising the upcoming Star Wars movie that was destined to reach theaters in 1977. It was debuted for the first time at the San Diego comic con in California and was for sale to comic book enthusiasts for $1.75. The size discrepancy is easy to spot. Fakes are observed as 27 x 40 inches, 15.75×23.5 and any other size that isn’t within a quarter of an inch of the 22 x 29 inch known originals. However, size alone is not enough to determine authenticity, as there are fakes with identical poster sizes. A fake Star Wars Chaykin comic con poster will have deeper colors than the original. The halo around the death star is deep orange in the fake and the black of outer space cuts out many of the stars that normally show. The missing copyright symbol on the bottom margin of the forgery is an excellent indicator aswell. The paper weight in the fake is certainly heavier than the original and text font along the bottom margin of the original is different if closely compared to a forgery. This for sale original Comic Con Movie poster #1 is backed with a 100% lifetime guarantee of authenticity and you will receive upon purchase an official certificate of authenticity. This Star Wars movie poster #1 also known as “The Chaykin” from the San Diego comic con is in fine condition. It does show some minor imperfections. There are three pin holes in the center top margin, the left top corner has some pinholes and one folded back tear, the upper right corner is crumpled a little and also has a few pin holes, bottom right and left each have one pin hole, the fold lines show general light wear and the poster was wrinkled a bit and shows some wear scattered throughout the poster. All of these minor imperfections will look much better following linen backing and light restoration. To see this poster and others visit our gallery the Limited Edition in old town Katy, Texas. Providing poster sales, Linen Backing, Restoration and Framing services to the Houston, San Antonio, Austin and Dallas regions since 1994.